The Cooks Professional Digital Rotisserie Air Fryer is sourced by the well known distributor and catalogue outlet Clifford James. The combination of hinged lid and safe to touch machine body, makes the Cooks Pro product a winner. The double cell construction effectively insulates the outside, making it much less of a hazard in the kitchen. Rather than a glass bowl as in the conventional type, the bowl is metal non stick, so is very easy to clean. The Cooks pro is equipped with a rotating spindle, so you can spit roast a chicken and with the attachment of a wire basket ( seen above ) you can tumble the most marvellous chips, all with minimal oil, just a quick spray will produce perfect chips. As with most modern gadgets, the LED display will tell you instantly what is going on. You can set heat and time easily, I’m not a fan of single displays, that is one display that shows temperature and if you press the button it shows the time setting. It is confusing when you are new or in a rush to get something done. Having said that, the Cooks pro model is laid out neatly and you can just about manage without looking it up in the book, too often. It has useful presets for Roast, Fry, Bake, Stir fry, Grill and BBQ. 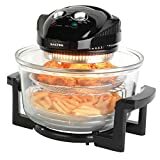 If you lift the lid during cooking, it will pause the timer and if you need to keep the contents warm after cooking, whilst other things are prepared , you can set it to run at 150 deg C.
I already had an air fryer, watching utube I saw the rotisserie air fryer and knew this is the one that I wanted in the first place, I can now do a whole meal in one go as I live alone I can eat healthier, I’ve not had it a week and already used it twice very happy with the food and my choice very good price cheaper than my first choice of air fryer. I had just bought a new cooker, but I have only used it twice since I bought my AIR FRYER its great. Wonderful roasties, yorkshire pudding and dumplings.